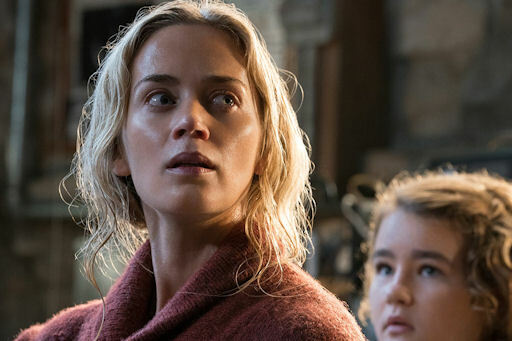 Review: A Quiet Place / It's Just Movies Review: "A Quiet Place"
The silent film is not particularly prevalent in today’s cinema experience. When I have asked people their thoughts on silent films, more times than not they have a preconceived notion of what that means. A very specific type of image springs to their mind and, almost always without pause, Charlie Chaplin becomes part of the conversation. In 2011, Michel Hazanavicius and team brought us the silent feature “The Artist,” which took home five Oscars. What could have been a gimmick was executed with finesse and people were falling in love with the silent film again. “A Quiet Place” is not an entirely silent film, but it lives in that vein and the premise of the story is, in my opinion, an incredibly creative way of making a modern film silent. The film takes place in a world where unknown creatures roam and hunt anything and anyone. The creatures are blind, thusly relying on an acute sense of sound to find and catch their meals. What this means for the human population is that noise is the enemy. We follow a family as they survive in this world, unable to make sounds. 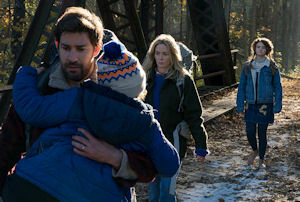 Emily Blunt and John Krasinski play parents who are protecting their children from what the world has become. One of their children is deaf and this allows the plot to flow as it explains how the family knows sign language and are able to communicate efficiently without words. The film poses a basic question, what would parents do to protect their children? Although mostly without spoken dialogue, the film uses inventive ways of integrating normal sounds, such as a Neil Young song. The sound editors for the film, Erik Aadahl and Ethan Van der Ryn, have created specific sensations in this world that effectively makes the audience part of the journey. What was interesting to me is that although the setting demands silence from the characters, the silence is never absolute. Ambient sounds exist, the sounds of whispers, water, the wind, leaves, hand movements and the sounds of the creatures themselves all become painfully amplified in the movie. The audiences awareness of noise was heightened throughout the showing of the movie. So much so that during a tense and suspenseful moment, a man in front of me coughed and you could audibly hear people gasp in a mild panic. It was evident to me in that moment that “A Quiet Place” is truly an experience for people who are watching. “A Quiet Place” stars John Krasinski and Emily Blunt. The genre is out of both their usual roles and I was quite anxious to see how they would do, especially considering Krasinski had a hand in the writing of the film and also took on the task of directing. Krasinski and Blunt continue to be all of the relationship goals after seeing them in this project together. 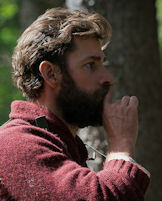 Krasinski plays his role with a stern and distanced quality that comes with being a father who must make choices for their children that they might not like but are certainly in their best interest. Blunt wears the guilt of a mother admirably on her face. Not to mention, she has to give birth in a situation wherein she must remain quiet. I had seen this scene in the trailer, yet it didn’t immediately dawn on me that babies basically come out crying and continue to do so on a daily basis. When I had this realization in the theater, the suspense grew. Needless to say, I was thoroughly impressed with Blunt’s performance. I plan on a second viewing of this movie not only because I thoroughly enjoyed it, but also because I think it is worth another look for the subtleties, metaphors and nuances I missed the first time. Keep in mind, this is definitely not a movie to chat during, you will immediately be noticed and more than likely hushed in panic.